For guitarists, tuning your guitar is a necessity. A piano gets tuned by a professional once a year or so. Guitars need tuning every time you play your guitar. But, there’s good news. The guitar only has six strings (the piano has hundreds). Open string refers to a string you play without pressing down on it with your left hand fingers. Fretted string is a string you play while pressing down on it at a specific fret. Relative tuning vs. concert pitch. If you’re playing solo guitar the six strings need to be in tune relative to each other. If each string, for example, is flat by one whole scale step, it’s not a problem. The guitar will sound fine played solo. But, if a keyboardist joins you for a duo, together you’re going to sound terrible. To play with the piano you need to tune to concert pitch. Your guitar’s notes are going to have to match the piano’s corresponding notes. Tuning up is a numbers game, here’s how to reference strings and frets. Strings — Strings are numbered 1 through 6. The 1st string is the skinniest. It’s the one that’s closest to the floor. Numbering goes up to the 6th string, the fattest string, the one closest to the ceiling. You’ll want to learn the letter names for the strings. This letter name is the note that’s sounded when the string is played open (no fretted). From 6th to 1st the letters are E – A – D – G – B – E. Remember the acronym phrase: Elephants And Donkeys Grow Big Ears. Frets A fret can refer to the space where you put your finger down, or the thin metallic bar running across the fingerboard. When dealing with guitar fingerings, fret refers to the space between the metal bars. However, when tuning by harmonics, I specify touching the string over the fret bar. Relative tuning means you will not be using any reference note to tune your guitar to concert pitch. The fifth-fret method is so named as you will typically play a string at the fifth fret and compare that note to the next open string. However, there is one exception at the 3rd string and 2nd string interval. Note: Beginner’s may find tuning by ear challenging. Don’t fret, get the note as close as you can. Over time, as you play your guitar and tune up, your ears will improve and it will get easier. Play a note at the fifth fret of the 6th (low E) string (the fat one, closest to the ceiling), and while that note is ringing, play the open 5th (A) string. We are going to change the 5th string to match the 6th string.Let both notes ring together. If they match, they’re in tune. If not, you need to determine if the 5th string is higher or lower than the 6th string. If the 5th-string note seems sharp, or too high, turn the tuning key with your left hand to lower the pitch. If the 5th string seems flat, or too low, turn the tuning key to raise the pitch. If you’re not sure if the 5th is too high or too low, then intentionally lower it until you are sure that it’s flat. Now raise the pitch and compare both strings. Still too low? Raise the pitch and compare. Repeat until the notes match. Play a note at the fifth fret of the 5th (A) string, and play an open 4th (D) string. Tune the 4th string. Play a note at the fifth fret of the 4th (D) string, and play an open 3rd (G) string. Tune the 3rd string. Here comes a change in the pattern. Play a note at the FOURTH (not the fifth) fret of the 3rd (g) string, and play an open 2nd (B) string. Tune the 2nd string. Play a note at the fifth (we’re back to the fifth) fret of the 2nd (B) string, and play an open 1st (E) string. Tune the 1st string. Your guitar is now in tune with itself. Tip: You may want to repeat the process, as a quick check. You likely won’t need to make any major adjustments. After you’re comfortable using your left hand to turn the tuning peg, try this slightly advanced method. After plucking both the fretted and open strings, and while they are both ringing, use your right hand to reach over your left hand to turn the peg. This will allow you to change the pitch of the string while the notes are ringing. Another method of tuning your guitar to itself is with harmonics. To play a harmonic, lightly touch the 1st string directly over the tweflth fret-bar (not the space between the metallic fret bars). Play the note. You should hear a clear, bell-like tone. This sound is called a harmonic. To tune a guitar with harmonics, follow these steps. Compare the harmonics on the fifth fret of the 6th string and the seventh fret of the 5th string. Tune the 5th string. Compare the harmonics on the fifth fret of the 5th string and the seventh fret of the 4th string. Tune the 4th string. Compare the harmonics on the fifth fret of the 4th string and the seventh fret of the 3rd string. Tune the 3rd string. Here comes a change in the pattern. Compare the harmonics on the seventh fret of the 6th string and the open 2nd string. Tune the 2nd string. Compare the harmonics on the fifth fret of the 2nd string and the seventh fret of the 1st string. Tune the 1st string. As long as you’re playing solo the relative tuning method is fine. But you’ll need to be tuned to concert pitch when playing with other musicians, instructional videos, Band In A Box, Garage Band, or other play-along materials. The following sections describe some typical ways to get your guitar tuned to concert pitch so you can play along with other instruments. A piano, because it holds its pitch so well, or an electronic keyboard is an excellent guitar-tuning tool. If you have a piano or keyboard, the following illustration shows the piano keyboard and the corresponding open guitar strings. You won’t always have a piano/keyboard on hand. So if you need to get tuned to concert pitch, and you want a device that will fit in your guitar case, try a pitch pipe. A guitar pitch pipe has six pipes to produce the notes for tuning your guitar. You can put the pipe firmly in your mouth and produce a continuous tone, having both hands free to tune your guitar. Using a pitch pipe does take some practice. It may take your ear some time to get used to hearing a wind-produced pitch, which has a different sound quality than a vibrating string. If you’re tuning a non-solid body guitar, you can use a tuning fork. Since you know how to tune your guitar to itself, you only need one reference pitch to get your guitar in tune. A tuning fork offers one pitch, the A above the piano’s middle C. This note vibrates at 440 cycles per second. Thus you’ll often see references to A-440 tuning. So, with the A-440 tuning fork you can tune your 5th string. To use the tuning fork you need to strike it against something firm such as your guitar case, your kneecap, or a table top. While the guitar is vibrating hold the ball-end of the stem against the guitar’s bridge, or on the soundboard near the bridge if you’re tuning a hollow body electric guitar. The A-440 note will resonate, providing you with the reference note for your 5th string A. Once you have your A string in tune, use it as the reference note for tuning the guitar to itself. Pianos, pitch pipes and tuning forks are not the only possible sources of reference notes. Many electronic metronomes, like the one I use, below. Will emit an A-440 tone. Frankly, it’s a rather annoying buzz-type of sound, but it gets the job done. 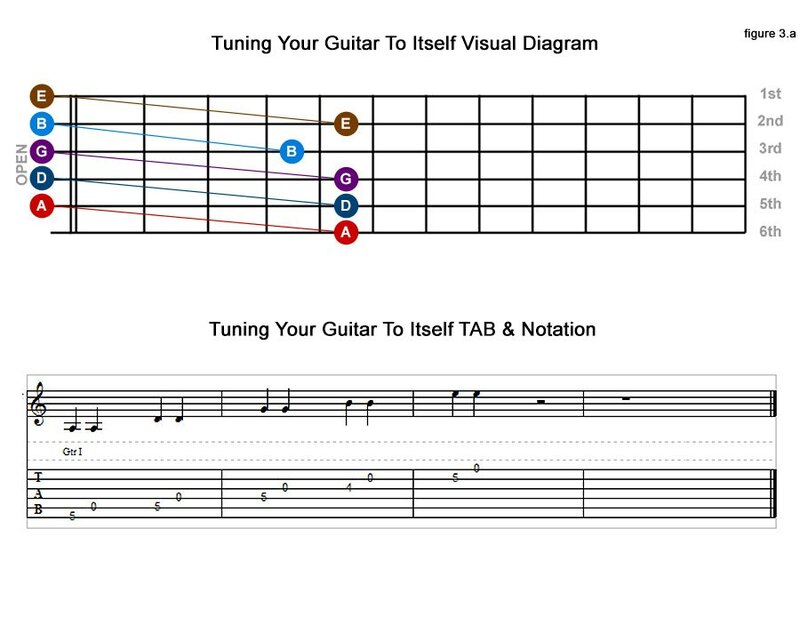 Many Web sites provide reference notes, search for “online guitar tuner.” Virtually any audio/video guitar instruction course will feature a tune-up track. The quickest, easiest way to tune a guitar is with an electronic tuner. Newer electronic tuners indicate the note that you played and if it is flat (too low) or sharp (too high). Electronic tuners have a built in microphone for acoustic guitars. Electric guitars can plug directly into the tuner. I recommend that you get yourself an electronic tuner. Still, I would highly recommend that you learn, at minimum, the fifth-fret method for tuning your guitar. Practice tuning your guitar by ear, use the electronic tuner to check yourself. You will get better with practice. Click here to find the best beginner guitar that suit you.